“Need a ride?” Joe asked, trying not to sound too hopeful. “Next time there’s a strike, I’ll schedule a Vespa ride in advance!” He could hear her smile over the line. Joe put down the handset with a sigh. He wrote out a note for Angela, that he thought he would be late again. Nancy would be back tomorrow, and his routine would go back to normal – no late nights translating. Maybe he could take Sandra on a date then. He gathered up his rucksack and walked down to the garage. The sun was already blinding as it rose in the cloudless sky. The city had that fresh, clean smell and feel that follows a serious storm front. He decided to take the side streets that roughly paralleled the Viale delle Medaglie d’Oro, just to be different. He also decided to park on Via Liguria on the back side of the Embassy Annex building. Maybe he had been leaving his Vespa outside the Annex too much, considering that he was being watched. He locked up the scooter and started walking toward the Via Veneto. Joe felt something coming up behind him. He started to turn around and felt both his arms lock up behind him and his feet came up off the ground. Whoever had lifted him moved toward the curb, as a dark blue car screeched to a halt in front of them. Joe noticed that it was a new Fiat 1900, but the engine sounded heavier. A man jumped smoothly around him and his attacker and opened the back door. His head involuntarily jerked down as the one holding Joe pushed him into the back seat while the other held the door. Joe reached across for the left door as one man jumped in behind him. The door opened and filled with the bulk of the other man, who swung into Joe’s face as the car burned rubber and took off. He sat on Joe’s hand, pinning him to the back seat. The fabric smelled of plastic and perfumed cleaner. The car was going too fast to be going through the downtown streets, so Joe guessed that they were taking the Via del Muro Torto west to something smooth-flowing, like the Lungotevere by the river or the Via Flaminia. Joe tried to twist and get up, but the thug on the left punched him hard from above and pushed his head into the seat cushion. After a second try, Joe took the hint and just tried to look out the window from where he was. He could see the tops of trees, tall fountains and buildings. His head ached from the twisted position. His back throbbed between his shoulder blades. His pinned hand was going to sleep when he realized that they were crossing the Tiber, because suddenly there were no buildings. Then they went through a tunnel, which had to be the Porta Cavalleggeri south of Saint Peter’s. Soon they were climbing the Janiculum Hill. The park-like setting and pine trees were unique. He saw the statue of Garibaldi go by after the road leveled off and guessed that they were heading out of town on the Via Aurelia Antica. The high walls of exclusive villas, Pontifical Colleges, and private schools confirmed his guess. 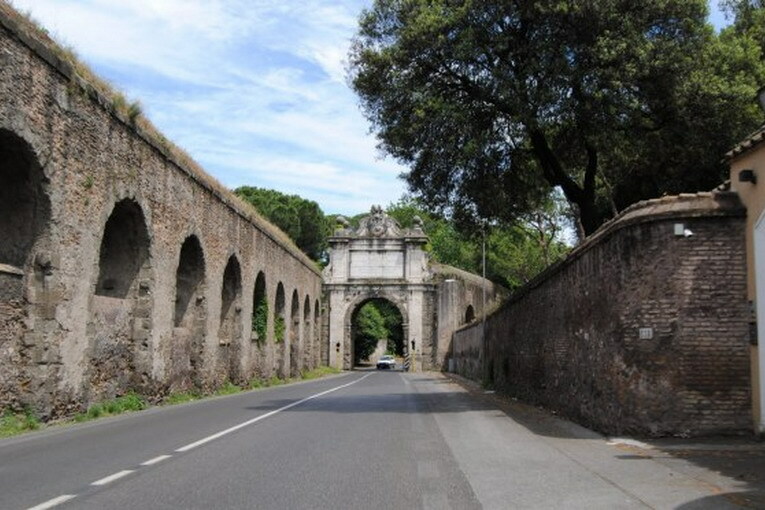 This was the original track of Rome’s first great highway that carried Julius Caesar’s armies to Pisa on their way to Gaul. Joe did not care. He had lost all feeling in his left forearm, and his shoulder and neck ached from not being able to move. The car slowed and turned into a villa. Joe’s recognized the carved lion’s heads on the gateposts immediately. Betty Walker’s old house. The Walkers had moved back to the United States a year earlier when her father was reassigned suddenly. As the car rolled slowly down the driveway to the stately entrance, Joe wondered who was in here now. No one, it turned out. The thugs jerked him from the car sharply, so he could not get out on his own. Someone pinned him to the ground, face down, while someone else almost tore his arms out pulling them behind his back. Joe tensed up hard from the pain and made fists while the thugs wrapped rope around his wrists and legs. Joe struggled until one of them punched him in the back of the ribs. “Live one, this fish,” said the one kneeling on his back. “Stronz’americano, I wish we could just finish him off and get out of here,” said the other one. Joe did not recognize their accent, but he could tell that they were neither locals nor Southerners. “Let’s get him inside,” said the driver. Joe felt his arm pull back again as one thug knelt on the backs of Joe’s knees and yanked back on the bound wrists. The driver and the other man grabbed Joe under the armpits and picked him up as the first thug stood back. Joe had never been unable to move himself before, and that bugged him more than the pain in his shoulders. The driver turned the rucksack over to the other man and went back to the car. The two thugs dragged Joe into the house, never really letting him stand up. The house was empty. From the dust on the furniture, Joe could tell that the owners had not rented it since Betty and her family had moved away. They pushed him into an armchair. The one who had talked about finishing him off pulled back his jacket and pointed to a large pistol in a shoulder holster, then pointed at Joe and smiled. He was missing two teeth, which went nicely with the scar on his cheek from whatever brawl. Joe felt a fear deeper than anything that he had ever experienced. He sat still. His left forearm was starting to hurt worse than his shoulders, and his fingers tingled. At least the blood was moving again. He heard the Fiat start and crunch the gravel on its way out. He got his first good look at his assailants. The nasty one was about Joe’s height, but very heavy-set. No fat, but Joe understood why his arm went to sleep under that sturdy bulk. He had a large round face and what looked like a two-day beard. The other one was as thin as his partner was hefty. He had only a five o-clock shadow. Both men moved quickly and stayed alert all the time, but the thin one’s movements were jerkier. Both men sported small, thick mustaches. “I’m going to see if there’s anything interesting in the kitchen,” said the thin one. “Sure, what’s he know?” They watched Joe all the time while they talked. Joe tried not to move and stared back. He had learned that any movement caused them to react. For some reason, this felt like the bus rides Joe took when he was small. He would sit quietly and listen with a blank expression while older kids would talk about him. Joe realized that the two thugs might not know that Joe understood Italian. For the first time since being captured, he felt a slight sensation of control. The thin one grunted and walked toward the kitchen. The heavy one sat in a leather-covered wooden chair across the room. He pulled the Gazzetta dello Sport from his jacket and folded it open to the racing pages. As he read, he rocked, and the chair squeaked, rhythmically. He paid no attention to Joe’s rucksack, which was thrown against the end of the couch on the floor. Once Joe shifted on the couch. He noticed how quickly the thug’s attention shifted to him from the racing pages. Clearly, he was not going to be able to work his way free or do anything else clever while they were here. He settled in to wait, listening to the creaking chair. It sounded like a sailboat rocking at anchor. Joe imagined the slapping of water against the hull to fill in the picture. He heard the Fiat returning. The thin man came back from the kitchen, and the driver walked in. The driver was younger than the other two, slender and athletic. He was well-groomed and clean-shaven. “OK, let’s go.” The big one stuffed the newspaper back in his pocket. He walked over behind Joe to check his bindings. Joe tensed his hands again, tightening up the ropes. “This one’s not going anywhere,” said the big one. The door slammed so hard as they left that Joe winced. In the silence, a piece of plaster over the front door fell to the floor. He could hear the traffic on the Via Aurelia Antica and the noise of the great city at the foot of the hill on which the villa stood. The trees and tall walls only muffled the general background rush. Time raced in his mind as Joe tried to get out of his bindings. He forced himself to relax his wrists as he tried to squeeze his hands free. It felt like forever, but he did it. He worked feverishly at the bindings on his ankles, the panic rising as he could not undo the knot. He had to stop and breathe long and deep to gain his composure. All too slowly, he found the end of the rope and began to work his legs free. The excitement rushed to his head as the blood rushed to his liberated feet. He heard the crunch of gravel in the driveway. Panic again. He grit his teeth and tried to think. He had to hope that whoever it was did not know the house and yard as well as he did. He grabbed his bag and headed away from the front door, down to the basement. He closed the door softly. At the foot of the stairs he put his pack on and tightened it while his eyes adjusted. In the dim light, he made his way among the equipment and wheel barrows to the small door that let out to the garden. Moving quietly and deliberately, he reached the edge of the house and crouched behind a bush where he could see the parking area. A navy-blue Lancia sat there, one of the souped-up, bullet-proof versions used by high-ranking Carabinieri officers. The white license plate – EI-004 – confirmed that it was an official Army car. The driver was a slender man in civilian clothes, standing erect by the rear passenger door. Two men came out of the house, one tall with gray hair. The other had short red hair and looked about forty years old. A chill ran through Joe’s chest. He recognized the older one from the magazine articles that he had translated. General Ettore Arcibaldo, the retired Commander of the Carabinieri Corps. “Yes, sir!” said the red-head. He got in the car and picked up the radio. The driver trotted up to the main gate and began scanning the fruit orchard in a systematic search of the yard. So, there are four of them, thought Joe. Carefully, he eased away from the scene. The landscaping included terracing behind the house, so he was able to crouch out of sight and make his way to the brush-covered hole in the wall that he had used when Betty still lived here. His heart still raced a little faster when he slipped through the hole. 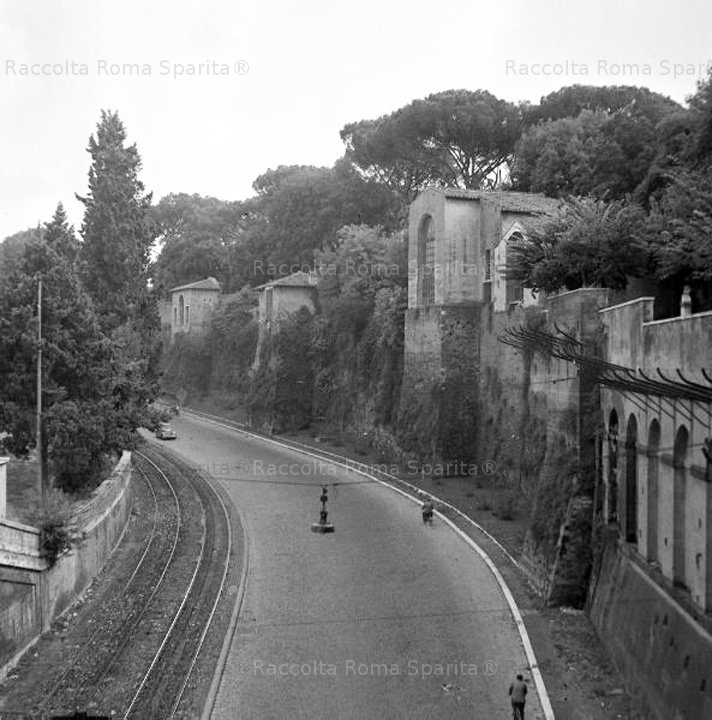 Outside the villa’s walls, Joe made his way through the neighbor’s olive grove down the steep hill to the wall that bordered the alleys that led below the Janiculum Hill to the river. A half-hour later, he was on the number 60 bus, headed downtown.